SenseTime has already partnered with various branches of the Chinese government. Here’s a group of people that just made more money than you’ve ever seen: Chinese company SenseTime recently announced that it raised $600 million in a recent fundraising round, doubling the company’s valuation, Bloomberg reports. It’s probably not a coincidence that the company also makes a tool that will help the government spy on its citizens. Yes, SenseTime specializes in facial recognition software, the kind that catches (then fines) citizens for jaywalking. In just three years, the company has apparently become extremely successful: “If you’ve ever been photographed with a Chinese-made phone or walked the streets of a Chinese city, chances are your face has been digitally crunched by SenseTime software built into more than 100 million mobile devices,” Bloomberg writes. It’s already partnered with Honda to work on autonomous cars, and telecommunications giant Qualcomm backed the company in the hope of putting facial recognition into the company’s smart devices. SenseTime’s success is an important stepping stone towards China’s plan to dominate the field of artificial intelligence by 2030. There are lots of reasons why this might be desirable, but one may be to fuel its social credit system. That system, which will be in place for all citizens by 2020, will determine everything from where children can to go to school to whether they can leave the country. With this most recent investment, led by China’s massive commerce site Alibaba (hmm, another coincidence perhaps? ), SenseTime plans to improve its AI platform, build infrastructure, and “open up new business opportunities,” according to CNBC. That almost certainly means SenseTime’s software will become more sophisticated and ubiquitous. 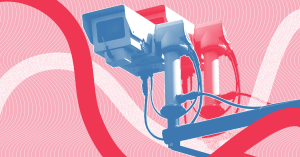 Facial recognition is quickly becoming so advanced that it evades attempts to outsmart it, leaving privacy-concerned citizens with fewer ways to avoid surveillance. That may already be true for people in China, a nation that seems to be trying to earn the title of Most Dystopian Nation on Earth.